For me, Thanksgiving is the ultimate celebration. Of course, at Christmas we celebrate the birth of our Savior. But at Thanksgiving we get to celebrate all that He does in our lives! Just him, your family and friends, and a year full of extraordinary blessings to be thankful for. 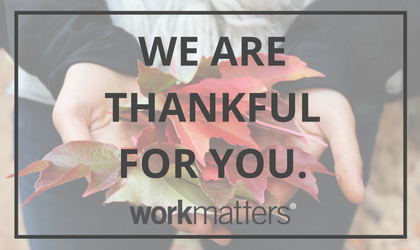 And today, our team at Workmatters wants to thank you! Thank you for your encouragement, your financial support, and your volunteering. For pursuing God’s purpose in your work. For being a multiplier inside of your company. Thank you for joining us on this journey to bring our whole selves to work. To bring passion back to work. To make the half of our lives spent at work really matter! As we take a couple of days off from our work this week, we embrace Psalm 100:4 for you!